Paul McCartney: cimbalom, oh yes, I love cimbalom . .
Paul McCartney recorded most of his forthcoming album, Egypt Station, in LA and Sussex, but the finishing touches were applied at the legendary Abbey Road in London, the studios associated with The Beatles’ classic recordings. Producer Greg Kurtsin has been telling Rolling Stone about the process of recording the new songs. "Sometimes he’d come in with a little bit of piano part with a vocal that he recorded on a phone. Sometimes at the studio in England he would kind of demo a little idea by himself where he’d play a few different instruments. Sometimes they were a little bit more arranged, but most of the time it was just a sketch of an idea. Sometimes he’d work them out in rehearsal with the band. McCartney plays bass, drums and piano on some tracks. The track Confidante, according to Kurtsin is mostly a Paul piece, "but then sometimes a studio musician would come in and play a little bit of strings, like a cello would be added or sometimes it would be a cimbalom." Then maybe half an hour would go by and I’d say, 'Hey, Paul, what about that idea I mentioned a little while ago?" He said, 'Oh, I heard you. I was just pretending to ignore you.' We’d just laugh about it. " Kutsin recalls their discussion of approaches to songs. "If he challenged me and wasn’t into the idea, I would realize, you know, that this is coming from a Beatle. He’s tried everything at this point. He’s done experimental albums. He’s done pop albums. Anything I could possibly ever want to do in the studio, he’s been there and tried it." Some of the songs are rock, a number are more acoustic-oriented and apparently a Brazilian-influenced one also got completed. "Sonically, he wanted to avoid anything ordinary, " says the producer who has also worked with the Foo Fighters. "He wanted to experiment. Take a song like Hunt or Hunt You Down – I’m not sure of the exact title he ended up using. He’d say, "Let’s pull out the guitars. A guitar is too obvious here. Let’s have a cello doing that." Egypt Station will be released in September. 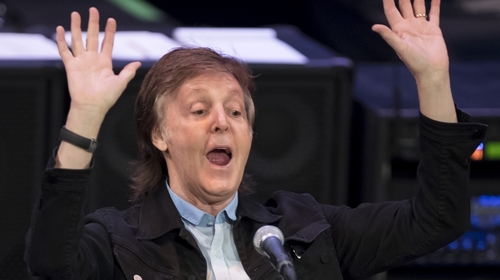 McCartney recently returned to the Cavern Club in Liverpool for a secret gig.